I am so excited to announce my Fundamentals Scrapbook Club! Teaching Fundamentals class last year was one of my very favorite things to do. I loved creating and knowing that you would be storing your memories on the pages through words and photos. So when we came out with a new Fundamentals line this year, of course I had to design a club around them! I'll show you September's layouts first, and then I will tell you all about the club commitment. Can you even how wonderful all those polka dots are? I've used the the new Cricut You are Here collection to create embellishments for these pages. Right after summer, I wanted you to have pages for your summer fun! So here are all the details. I've got a link at the end for you to contact me to sign up! Make It From Your Heart Fundamentally will be the second Tuesday of each month at 6:30 pm. · An 8-month commitment is required. · Join by September 1st, 2017. · The cost each month is $32.00. · You can choose to join the club long distance. A shipping charge will be added to your order. · We will use a lot of Cricut cuts during this year’s club. Along with the Fundamentals and cardstock, you will see me using glitter paper, vellum, and/or our new silver and gold cardstock. The total cost for 8 months is $256, and you will complete 32 pages! 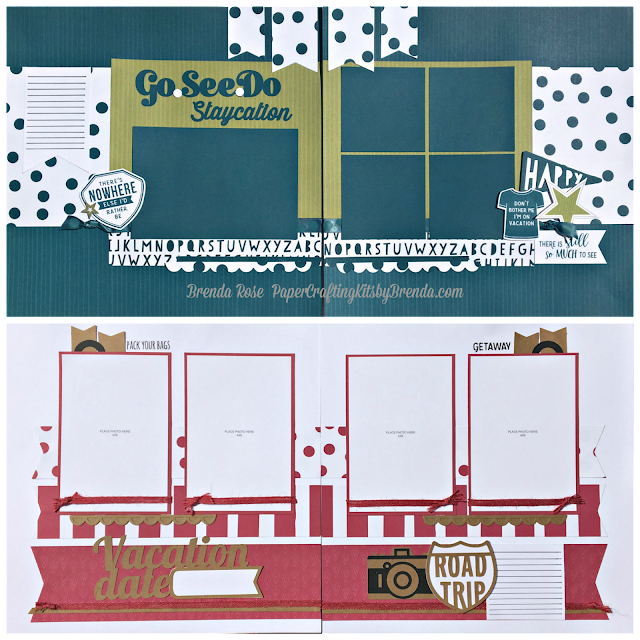 Make It From Your Heart Fundamentally Scrapbook Club is a great way to budget your purchase AND use bunches of product from the Annual Inspirations Idea Book. If you would like your photos printed and ready when you come class, I can do that for you on my Epson PictureMate printer. I have used only this printer for the past three years because I love the quality of these matte prints. The cost is $0.40 per photo. I will let you know each month what the photo sizes and orientations will be for the following month. E-mail me your photos no later than one week before class. I will have them ready for you when you come to class and you can pay for them with your club fee. I am adding this as a service to you so that you can go home with completed pages! · I will send an e-mail or Facebook message one day before club to remind you. · We all get busy! If you cannot attend one night for some reason, I will contact you for your credit card number for the following month’s payment. If you would like your kit mailed to you, there will be an extra $7 charge. NOTE: It is important that I collect money each class night because that is the money I use to buy the class materials for the next month. Thank you for understanding! · We will be using Make It From Your Heart Volume 3 for the base patterns of all of our layouts. It is our new How-To book. Because I pre-cut all the materials, I will not be creating cutting guides. Rather, you will receive photos of the layouts with simple instructions. · After we have completed one Fundamental paper packet, you will receive all the extras. You will have remaining paper, ribbon, and complements to use as you’d like. · If you order the kit long distance, I can combine two months so that you save one shipping charge. The long distance kits will be mailed the same day as the in-home class date. I will also have adhesive tape runner, refills, glue dots, and 3-D foam tape and dots on hand for you to purchase. COMMENT BELOW OR E-MAIL ME AT girlygirlrose43@msn.com TO SIGN UP! !